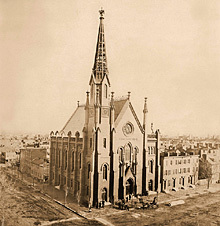 If you could have stood at Cluss's masterwork, the Smithsonian's National Museum building, in 1890, you would have had in your eyesight a major building by Adolf Cluss in every cardinal direction. 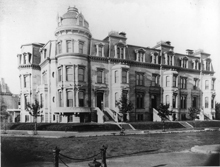 To the north was the Central Market, to the south was Tabernacle Church (with the Jefferson School) behind it, to the east the Army Medical Museum and Library, and to the west of the Smithsonian building (now called the Castle, on which Cluss worked for more than 20 years) was the Department of Agriculture building. 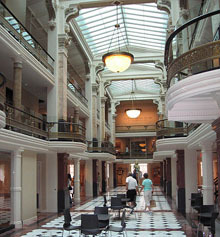 In the center was the most complex of his commissions, the National Museum. Each of these large public facilities was executed in red brick, as were the domestic buildings and the government buildings of the period. 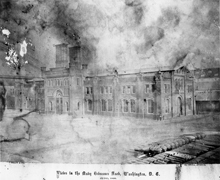 Red brick was the building material of choice for Washington in the 1860's through the 1880's. Bricks may have different meanings in different buildings; meanings are a subtle construct of circumstances. The architecture of Adolf Cluss is a good lens to focus on its meaning. There are technical and economic reasons for the use of brick. Industrial materials were admired in the post Civil War and post industrial revolution boom of industrial growth. Brick was locally manufactured and plentiful. Those who built for purposes of speculation found brick economical; those building for show could choose more specialized brick such as pressed or glazed. There is also the fireproof quality of brick when fire regulations were eliminating wooden structures in the city. Brick satisfied a desire to show that this building was different from a building of an earlier period and was thus modern, not tied to other cultures, classes and styles; brick can be sleek and structural. Brick satisfied the Romantic period's taste for rich color effects in architecture as Liszt's lush compositions did for music. In the period, the use of brick for color effects was dominant in France, Germany, and England for certain building types. 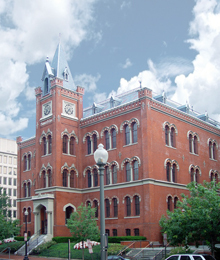 Adolf Cluss, usually working with partners, designed and built about 90 buildings from about 1862 to 1887, mostly in Washington, DC. 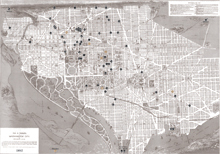 Building permits are an important source of information about his work, but Washington permit records are available only after 1876 (now indexed in a DC Department of Planning database; originals at the National Archives and copies at the Martin Luther King Library). 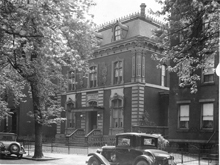 Since building permits do not prove that the planned building was actually constructed by the architect named on the permit, other sources, such as newspaper accounts, photographs, personal letters, records and diaries, and Cluss's own lists of his work, were used to corroborate building permit information. Many of these documents can be found in the research files on Cluss at the Smithsonian Institution Archives (see: http://siarchives.si.edu/collections/siris_arc_282638). 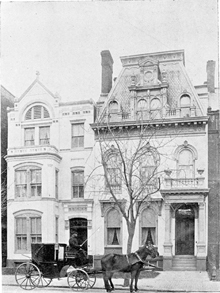 Cluss compiled lists of his buildings on three occasions: Washington's Evening Star (October 19, 1872), Coffin's Washington: The Nation's Capital (1886), and in his application for a position as federal building inspector (1889). All of the lists detailed his public buildings, but none of them give much information about his residential work or many of his military buildings. All of the lists contain references to buildings that have not yet been identified. 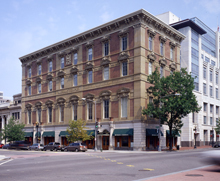 Buildings for which there is inconclusive evidence are listed separately below in the category "Buildings possibly designed by Cluss but not confirmed." 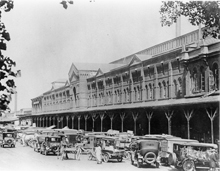 Sometimes Adolf Cluss accepted jobs as a builder, what is today known as a general contractor, for structures designed by other architects, most done after he retired from his architectural firm. The W.N. Teller Residence (36) seems not to be build by Adolf Cluss.